Anybody who conducts research on New York City buildings knows what a rich body of material is available—thanks to the city’s libraries, archives, and collections of public records. Few cities can compete with New York’s wealth of resources. But none of those records would exist were it not for the determined souls who saved them from destruction, and none would be of much use were it not for the librarians and archivists and civil servants who collect and sort and conserve the millions upon millions of pages—and who help researchers find their way through it all. Behind every good historian stands a determined team of paper hoarders, dumpster divers, and archivists. I first experienced archival immersion at the library of the Port Authority of New York, haunting it for months in search of material for a book on the original World Trade Center. In the PA’s library on the 55th floor of Tower One, I pored over early plans and correspondence, papers related to the evolution of the project and its design, chronologies, “fact sheets,” hundreds of magazine and newspaper clips, two fat volumes of the “World Trade Center Evaluation of Architectural Firms”—reams and reams of invaluable material, without which that book couldn’t have been written. A cost-cutting Port Authority chairman later closed the library and stored its contents in a sub-basement. A group of librarians had planned to meet at the Center to divvy up the materials among various institutions, but by chance postponed the meeting—which had been scheduled for September 11th, 2001. Though the disaster destroyed the originals, some 600 pages of copies survived in my own files. It took some doing, but those pages are now scanned and posted on my web site—a digital archive. I discovered the New York Transit Museum’s extraordinary archive while researching books on the art and architecture of the subway and Grand Central Terminal. I spent several weeks in a small office in the basement of a Transit Authority tower in downtown Brooklyn, looking at masses of material about those icons of New York transportation— documents brought to me from the surrounding library stacks. Two excellent archivists helped me find the most relevant material. Without them I would have needed months to do the work. Anybody writing about the history of theater in New York must spend time at two extraordinary collections: the Billy Rose Theatre Division at the New York Public Library for the Performing Arts at Lincoln Center, and the Shubert Archive housed at the Lyceum Theater on West 45th Street. The archive office is on the theater’s top floor, and millions of documents are in a loft building behind it. The Billy Rose Division is one of many research centers in the New York Public Library system, but the Shubert Archive is a private venture. The Shuberts have owned or operated hundreds of theaters around the country, many of them blessed with nooks and crannies into which, over the decades, theater managers and superintendents stuffed old plans, correspondence, and playbills, until the Shubert Organization pulled all the material together and created the archive in the 1980s. It’s amazing where documents lie unnoticed until being rescued. Theater architect Herbert Krapp’s papers, now safely entrusted to the Shubert Archive, were once famously stored next to a movie theater’s ladies’ restroom. The Brooklyn Bridge drawings—the Brooklyn Bridge drawings!—languished in a carpentry shop beneath the Williamsburg Bridge until 1976, when they came under the protection of the New York City Municipal Archives. Many architects’ papers had long gathered dust in vaults and warehouses, until inevitable bouts of cost-cutting led to a riot of dumpsters. Fortunately for architectural historians, in 1973 a determined group founded COPAR, the Committee for the Preservation of Architectural Records, which tracked down as many such records as possible, published guides to their whereabouts, and did their level best to find them loving homes. Fortunately for them, and for us, at about the same time the Avery Library at Columbia University began to accept architects’ papers (NYPAP honored Janet Parks, retiring Avery archivist, at last year’s Bard Breakfast). I still have my copy of COPAR’s Architectural Research Materials in New York City: A Guide to Resources in All Five Boroughs—several hundred sheets with reinforced edges, covered in blue type and collected into a three-ring binder. And then—surprise! Live long enough, and stuff enough old papers into battered file cabinets, and you too may one day become an archive. I’m just one of many people who have stubbornly held on to crumbling file folders, forgotten them, and then in a fit of downsizing discovered the value of their contents. My old papers from the 1970s, when I volunteered with Margot Gayle’s legendary Friends of Cast-Iron Architecture, have now found a cozy nest in the library of the New-York Historical Society, which is building an archive of materials related to historic preservation in New York City. And that brings us to the New York Preservation Archive Project (NYPAP). The key to this kind of work is to get it done while there’s still time. Collect the papers before they’re shredded. Interview the key players while they’re still with us. It takes time, and curiosity, and ingenuity, and determination, and of course, money, but the results are there for all to see—especially now, in the digital age. Although, once upon a time, archives lived brick-and-mortar lives, today more material than you might imagine has comfortably retired to the cloud. You can scroll through vast amounts of archival material from the privacy of your desktop, and all that material is not only accessible, it’s searchable. If you don’t believe me, take a few minutes to visit the NYPAP website—you’ll soon be reading transcripts of interviews, or, better yet, listening to the recordings themselves. It’s raw information, as all archival material must be, and it needs to be checked and confirmed and properly interpreted. But it’s there—ready and waiting for the next historian or student or daydreamer curious to know how so many of our city’s wonders have evaded the bulldozers and how we have managed to preserve the best parts of New York from the whirlwind of redevelopment that continually uproots the old to make way for the new. And if you’re reading this column, then you’re part of the reason our collection survives and grows. Please consider reaching out to NYPAP if you are aware of any papers or archives related to the story of preservation in New York City that are ready for donation. Thank you for your support! The Archive Project’s Stewardship Society tours the Shubert Archives – photo courtesy of the Archives Project. 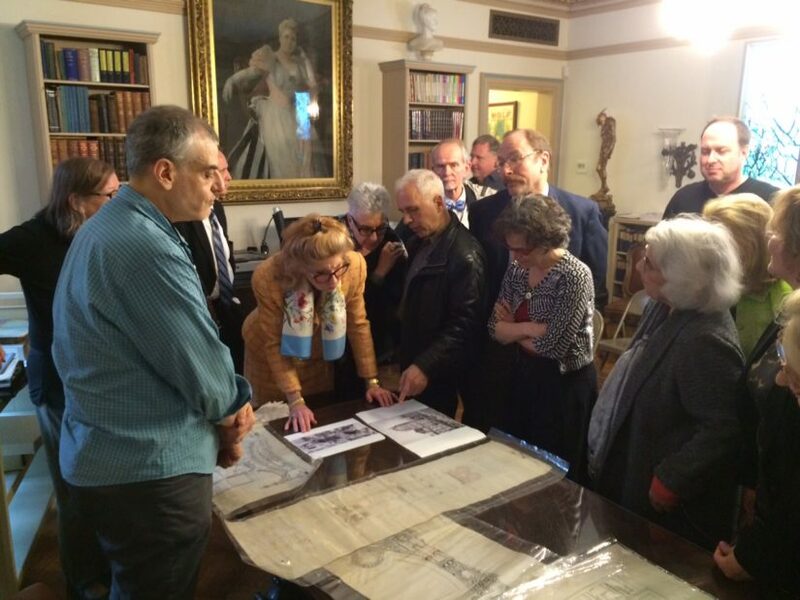 Above: The Archive Project’s Stewardship Society tours the Shubert Archives - photo courtesy of the Archives Project.